Former Arsenal forward Nicklas Bendtner has been released from training duties by Wolfsburg, with a decision over his long-term future expected imminently. The 28-year-old has had several disciplinary issues this season and was recently fined for oversleeping. He has over a year left on his current contract, but has not played for the first team since early February. "The situation cannot endure," said Wolfsburg's director of sport Klaus Allofs. "For this reason, we sat down again on Wednesday and, together with his agent, we discussed solutions." Bendtner, who joined Wolfsburg from Arsenal in August 2014, has scored two goals in 13 league appearances for the Bundesliga side this season. 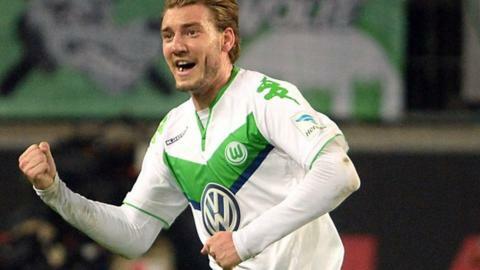 A statement on the Wolfsburg website said a decision on Bendtner's future would be made "shortly".